In his recent series “Kobo”, Joël Tettamanti, by focusing on a specific clothing, builds a portrait of the Basotho people who belong to the independent kingdom-enclave of Lesotho in South Africa. Photographer and traveler, Tettamanti traces the human imprint across the planet, especially of the architectural variety. In “Kobo”, the imprint of humanity lies at the heart of his images. 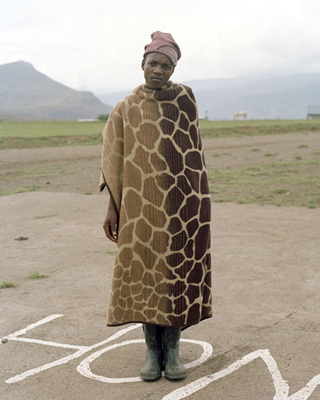 Under colonial rule, the Basotho people replaced their traditional skins and furs with covers manufactured in Europe. These standing portraits suggest this historical legacy while simultaneously inscribing them in a vast timeless landscape. Portraits assume an ever greater importance in the works of the Swiss photographer who was born in Cameroon in 1977 and spent his childhood in Lesotho.